Dolly is an 11-month-old female, born January 2002. 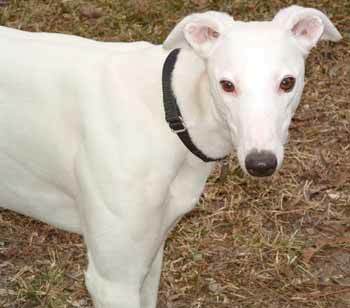 She is solid white except for a few tiny brown speckles on each ear. 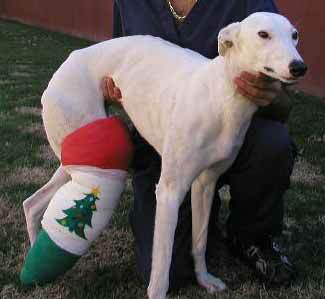 GALT received an emergency call on Friday, December 20, about 3:00 pm about a greyhound that had just broken a leg about an hour prior to the call while training at her breeder's farm. 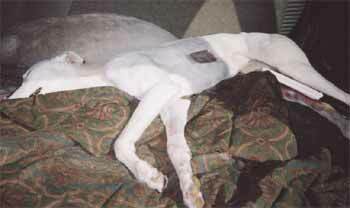 He was looking for a group to take Dolly, as the expense for her medical attention was too much, and she would be put down if one could not be found. GALT immediately made arrangements to pick Dolly up, and within 2 hours she was being evaluated by Dr. Jeff Ellis at Preston Park Animal Hospital. 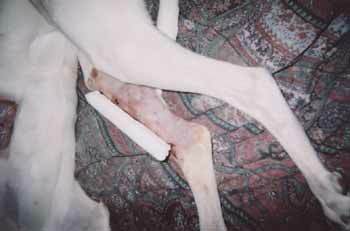 Dolly's right rear leg is shattered just above her hock, requiring specialized and complicated surgery. GALT immediately called Dr. Mike Herron, who has been a Professor in Orthopedics at Texas A&M University College of Veterinary Medicine since 1979. Dr. Herron's expertise in orthopedic procedures is recognized throughout the world due to his involvement in Greyhound and Canine Performance Sports Medicine. Dr. Herron readily agreed to operate on Dolly, and because of the holidays, her surgery is scheduled for December 27 in College Station. 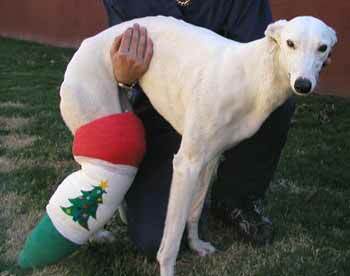 Until that time, her leg must be kept in a soft cast to minimize the swelling and further damage. Cost for this surgery has not been determined yet, but it *will* be expensive. On Friday, December 27, Dolly was driven to College Station for her appointment with Dr. Herron by GALT volunteers Rob Banes, Susie McQuade and Carol Sahlfeld, who is Dollys foster mom. 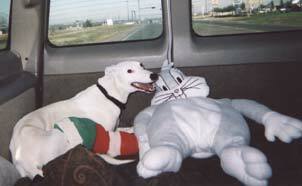 Dolly was ready to get her temporary soft cast removed, as it was very cumbersome. Her surgery started at 10:30, and she was awake and ready to leave by 12:30. Dr. Herrons expertise in this kind of orthopedic procedure is known world-wide. GALT is very, very fortunate to have him as a resource for its greyhounds, and we really appreciate his cutting his vacation short to help Dolly! Two screws were placed into the bone above and two screws placed into the bone below the actual break, and then tape is wrapped around the protruding ends. This stays in place for at least 4-6 weeks, and an x-ray will determine when the bone is mended for removal of the screws. Dolly is tolerating this appliance, and is beginning to put weight on her leg. Her progress is being monitored weekly by Dr. Jeff Ellis. Dolly continues to put more and more weight on her leg, and an x-ray will be taken soon to determine if the break is completely healed. Her foster mom is starting to have trouble keeping her from running, so that is a good sign! Dolly is progressing along quite well; she has been spayed and the apparatus will be left on her leg just a while longer.